Episode 6 of this series has since been transformed into colour, but currently is only available on DVD in Black and White. Episode 1 : "The Armoured Might Of Lance Corporal Jones"
Walker has a quiet word with Jones in his shop fridge, to discuss loaning his butchers delivery van for platoon use, he also thinks he can use it for his black market activity and Jones will get petrol coupons in return. Jones agrees and the van is converted for military use. It can also be used as an ambulance and is comandeered by the new Cheif Warden Hodges, and just when Jones thinks he will be getting some petrol coupons, the van is converted to gas. Walker puts his bayonet through the gas pipe and the van runs out of fuel, they restock from the vicars gasfire. Episode 2 : "Battle School"
On the way to a battle school for the weekend, Mainwaring gets them lost even thogh he claims he knew the way. When they arrive they find they are too late for dinner. In charge is a Captain Rodriguez, who fought in the Spanish Civil War and hates military discipline. He tells the platoon that they are here to rough it and gives them raw carrots and onions to eat. The following morning they are too late for breakfast as well. He puts the platoon through their paces, but when Mainwaring tumbles down a bank and discovers a tunnel which leads to Rodriguez headquarters and catches them unawares, they go home quite happy. Episode 3 : "The Lion Has 'Phones"
Mainwaring is giving on lecture on the importance of communication, and believes if the Germans arrive they will try and capture the Telephone Exchange, Reservoir and railway brige. He discovers that Godfrey and Pike don't know how to use a public phone. So he gives then a lecture in a phone box, Pike phones the church hall and is surprised to find his mother there, she gives Mainwaring and Wilson a telling off as she doesn't like Frank using public phones as they are unhealthy. Later, Fraser and Walker see a German plane crash in the reservoir and the Proper army turns up, claiming it is their responsibility, but Mainwaring doesn't like this. Eventually the sluice gates are opened, which means the Germans will have to swim or risk being drowned. Episode 4 : "The Bullet Is Not For Firing"
The platoon return to the church hall after being on night patrol. Mainwaring asks them to hand over their ammunition, and is shocked when Jones states they haven't any left. Mainwaring won't stand for such a wasteful use of precious ammunition and calls for a court of enquiry. The court of enquiry is interrupted by the vicars choir practice and Jones thinks his time has come! Episode 5 : "Something Nasty In The Vault"
Walker tries paying a fiver in at the bank, but Pike thinks it's a fake. In the queue is is the bank inspector Mr West who isn't too pleased to hear this. While West is seeing Mainwaring regarding his monthly reports, the meeting is interrupted by an air raid. They return a couple of hours later to discover the bank has taken a direct hit and Mainwaring and Wilson fall through a hole in the floor and end up in the basement holding a bomb. Jones fetches help and in the end they get out OK. Later, Mr West decides to reward the platoon with a drink, he pays with a £10 note, only to be told it is fake! Episode 6 : "Room At The Bottom"
In Mainwarings absence, Wilson is told that there were no commissions in the LDV and was never a captain and Wilson has to tell him he has to remove one of his pips, but before Wilson has a chance to tell him, the Verger rushes in to tell them the Bismarck has been sunk. Mainwaring is absent again when Wilson receives a message that he has to be demoted to private, and Wilson is to be temporarily in charge. Mainwaring is furious, but decides to stay on as a private. At the weekend Wilson leads the men into an ambush, and the men write to HQ to ask for Mainwarings reinstatement. He eventually gets his commision. Episode 7 : "Big Guns"
The platoon get excited when they get a large naval gun, but no one knows how to use it, even Fraser who was in the Navy. They do have a manual and try using it, to no avail. Mainwaring decides that the bandstand is in the line of fire and asks for it to be dismantled to local council, to which he is refused. He decides to put on a display with the gun to prove his point, but the display is such a shambles, it is total waste of time. Episode 8 : "The Day The Balloon Went Up"
Mainwaring is telling the platoon they are getting too slovenly when the Vicar comes in and tells them that somebody has written something obscene on his spare harmonium. Whilst looking at the harmonium and comparing handwriting, they notice the Verger float past the window. It transpires that he is hold of a barrage ballo and they rescue him. They report the matter to the RAF, who tells them that in the meantime the platoon are in charge. they gujde the balloon into Pinner Fields but Mainwaring gets hoisted uo and into the air on the balloon. They finally rescue him at a railway bridge, just before a train arrives. Episode 9 : "War Dance"
Mainwaring organises a platoon dance, but Pike announces that he wants to bring Violet Gibbons and he tells Wilson he intends to announce their engagement. They try and talk him out of it but fail. At the dance Mainwaring turns up with a black eye, and says Mrs Mainwaring has burnt the sausage rolls she was making and he has reprimanded her, of which obviously she didn't like. Pike makes his announcement and Mrs Pike faints. It turns out to be a very short lived engagement anyway. Episode 10 : "Menace From The Deep"
Whilst the Navy have a break, the platoon are to man the machine gun post at the end of the pier. Once they arrive, Mainwaring tells Pike to go and fetch the food from the boat, only to find that the boat has been washed away on the strong tide and has broken the phone cable as well. They are marooned and decide to use morse code, which Warden Hodges sees from shore. He paddles out to the pier, but the boat sinks and he ends up marooned with the platoon. In the morning Jones spots a mine drifting near the pier. Hodges falls into the sea and follows Hodges. He eventually gets back on the pier, throws an object at the mine and blows it up, saving them all. Godfrey decides to resign from the platoon and Mainwaring asks him why. Godfrey states that as he found a little mouse in his larder and couldn't kill it, he certainly couldn't kill a German. Mainwaring asks how he managed in World War One, to which Godfrey says that he was a conscientious objector. Mainwaring is shocked and disgusted and sends him home. He tells the platoon, who in turn all cold shoulder Godfrey. Later, at a civil defence excercise, Mainwaring collapses in a soke filled hut and is rescued by Godfrey. 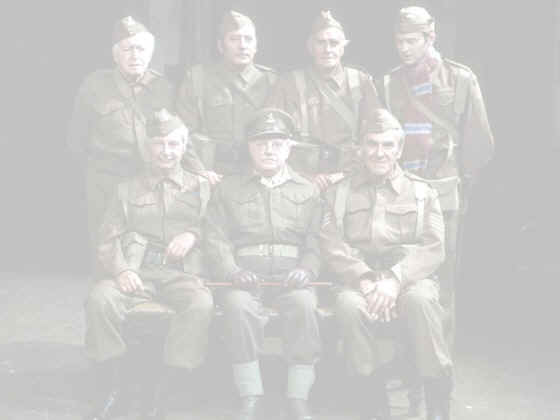 They all turn up at Godfreys house and Mainwaring sees a photo of Godfrey on the wall with his military medal and they realise they judged him too quickly. He is made the platoons medical orderly. Episode 12 : "Man Hunt"
GHQ informs the platoon that empty parachutes are being dropped to cause confusion. Walker tells Mainwaring and Wilson that he found a parachute in the woods and had it made into ladies knickers. They then have to go knocking on doors to ask for the knickers to find out what colour they were (White - British parachute, Dirty off white - German parachute). They don't have any luck. Walker gets a tracker dog to help in the search. Hodges finds a parachute stuck in a tree, and is so pre-occupies he doesn't think anything of the foreign man who asks directions to Downsend Woods. The platoon drive by and the dog picks up the scent of the German man who turns out to be a Viennese ornithologist. A real German airman is desperate to give himself up. Episode 13 : "No Spring For Fraser"
Fraser has been looking after the Lewis gun, but when Mainwaring inspects it he finds the butterfly spring is missing. They discover the spring fell into the coffin of the recently deceased Horace Blewitt, and pay a night visit to the home of his brother Sidney, in whose house he lies at rest. The lid has been screwed down. They try and get it by causing panic at the funeral and saying there is an unexploded bomb in the area. It eventually turns out that the spring wasn't in the coffin after all, but in Frasers pocket. Episode 14 : "Sons Of The Sea"
Mainwaring takes possesion of a boat owned by a recently deceased client from the bank, which the platoon uses as a patrol boat. They become lost in the fog and drift for hours in the English Channel. When they reach land they mistake the sounds of a French Canadian party, for the enemy. They hide in a railway wagon overnight and wake to find themselves on the move through the countryside. They decide to try and embark at points along the journey, until the train stops and find that they are Eastbourne!